Weekly bin collections, solar panels and a satellite TV connection are the three biggest ‘deal-sealers’ when home owners decide whether to buy a property or not, research has found. Greenhouses, walk-in wardrobes and a good 3G mobile signal are also important, according to a poll of over 1,000 people by ING Direct, the mortgage provider. The “extras” are all non-essential aspects of a property. However homeowners said they are the things that would encourage them to sign on the dotted line if they are wavering about whether to buy a house or not. Four in ten people said that the most desirable extra on a home is solar panels. More than 360,000 homes in the UK currently use solar power. Rising fuel bills have increased the number of people looking for alternative, more affordable ways to power their home. Meanwhile a third of people said that weekly bin collections would tip the balance if they were in two minds about a home. 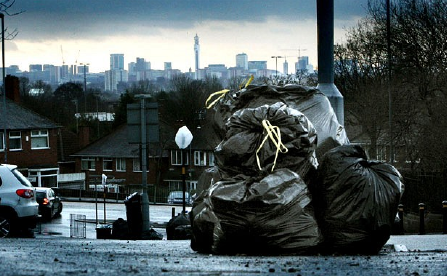 Over half of British households no longer have a full weekly bin collection service, a number which has grown steadily since Labour abolished the duty to make such collections as part of its plan to enforce recycling targets. competitive edge.” Other items deemed desirable were a giant bathtub, and outdoor power supple, a pantry and a garden pond.